It is important to share the history of Bengal in order to clearly understand the period of styles that were a major influence in the ornamentation, form and shape of antique artefacts. These being developed are true to its period. As a definite reflection of culture and lifestyle the rulers of Bengal left a legacy of heritage in its arts and architecture. The dynasties and empires that ruled Bengal over the past thousand years have remained a great source of inspiration for our artistic ingenuity. The pre-Gupta period of Bengal is shrouded with obscurity. It is with the conquest of Samudragupta that Bengal came under a single rule. In the early middle ages around sixth century AD, Bengal was divided into two kingdoms- Pushkarana and Samatata. Chandragupta II defeated a confederacy of Vanga kings resulting in Bengal becoming part of the Gupta Empire. This empire became independent and unified the smaller principalities of Bengal. This empire was the first independent Buddhist dynasty of Bengal. The name Pala means protector. It may be considered as the golden era of Bengal. Never had the Bengali people reached such heights of glory. Palas were responsible for the introduction of Mahayana Buddhism in Tibet, Bhutan and Myanmar. It was during the Pala period that Bengal became the centre for Buddhism as well as secular learning. The Palas had extensive trade in Southeast Asia. This can be seen in the sculptures and architectural style of the Sailendra Empire, which is present day Malaya, Java, and Sumatra. There was great cultural renaissance during the rule of the Pala kings. The arts flourished with their patronage. The Sena rulers were Hindu revivalists who neglected the Buddhist centres of learning as well as the universities. It was during the 12 century when Ballal Sena introduced the Hindu caste system in Bengal. Sena dynasty brought a revival of Hinduism and cultivated Sanskrit literature in India. King Lakshman Sen expanded the empire from Bengal to Bihar, Assam, Orissa and Varanasi. The Muslims later defeated him. Muslim invasion of India came in the early 13 century. The invaders under the leadership of Ikhtiar Uddin Muhammad Bin Bakhtiar Khilji defeated the Sena king Lakshman Sena in 1204. During the Muslim period the kingdom became known as the Sultanate of Bengal. This of course, also came to an end with a more established Mughal rule during the sixteenth century. In 1534, the Pastun Sher Shah Suri during the rule of Humayun captured both Delhi and Agra and the empire stretched from Sonargaon in Bengal to Peshawar in Hindu Kush. It was three hundred years of foreign rule before Bengal was left to a governor. Around 1576 Bengal became a 'Mughal subah' ruled through subahdars (governors). Akbar exercised progressive rules and oversaw a period of prosperity through trade and development in Bengal. The East India Company continued to rule Bengal for a hundred years starting from 1757. It was with the Indian mutiny of 1857 that the Company's rule was replaced by the direct control of the British Crown. A centre for rice cultivation as well as fine cotton called muslin and the world's main source of jute fibre, Bengal from the 1850s became one of India's principal centres of industry and the major source of income for the British Raj. In 1877 when Queen Victoria took the title of “Empress of India” the British declared Calcutta the capital of India and ruled India until 1947. 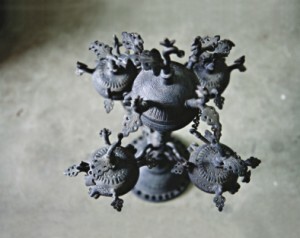 A lamp stand: Oil lamp or a candle stand of mixed metals from the Mughal period. The five deer holding the platter are fantasy figures ornamented in the Persian style. Similar figures are evident in Persian paintings and surface ornamentation. Paan dani: A betel leaf holder made of copper. A Turkish variation, the pinnacle is a pointed apex that is commonly found in Central Asian products. The Jaali, a cutwork of geometric formation is used with Islamic influence. Interestingly, there is the use of 'Makar' a fish from Hindu mythology as an application. This shows the integration of cultures. 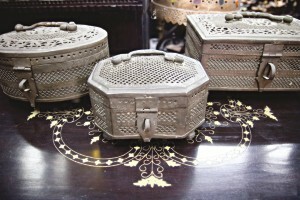 Betel leaf holders made of brass. From the late Mughal period, it is in a popular oval and hexagonal shape. This also contains jaali work. 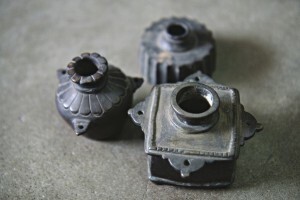 The foot stands and handles are finished with rounded minarets commonly represented in Mughal architecture. 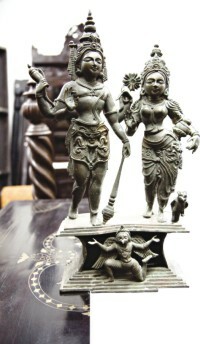 Shree Laxmi and Narayan figurine: Laxmi is the goddess of wealth and prosperity and the wife of Narayan. Garuda is the bird she uses to fly to her destinations. 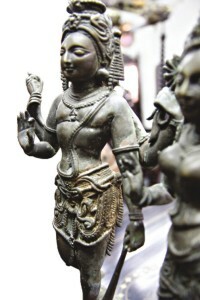 Influenced by late Sena dynasty, this figurine is made of mixed metal. Metal flower vase: From the late Mughal period, this is a beautifully formed artefact. Simple diagonal lines on the surface and a magnificently perfect shape. The vase is made using mixed metals. Base of the hubble-bubble: Surface ornamentation using fantasy floral balanced beautifully with geometric designs from the Mughal period. The borders work well as the fillers. A bell shaped utility product sits well as a period piece. Also made of mixed metals. The powder case, Victorian: The 'Mem Sahibs' used such boxes to hold cosmetics and for other purposes. A personalised utility kit with clean lines, these are very commonly used on sterling silver as well for the same usage. It is made of mixed metals. All purpose utility units: Ladies may have stored their special wears in them. From the Sena period, its face reflects the beautiful Seeta. The central face balanced by six more tantric infinity as in a Mandela. The central source of the universe. A wine vessel: Clearly an early Turkish influence during the early 13 century when Bin Bakhtiar Khilji, a Turkish general invaded and conquered Bengal. This particular item represents the era in its finest form. Ogee designs on the surface with a central tree of life pattern. Oval in shape, with sharp spout. Humbol Deesta (Mortar and Pestle): A crusher for seeds or herbs. Widely used for medicinal purpose. Late Mughal period. A hexagonal geometric shape. Terra cotta plaque: Shree Raddha and Shree Krishno, Hanuman, Shree Krishno with flute and Mohadeb from the Sena period. Tile ornamentation possibly used for temples. Ink pots. Found in various shapes and sizes, these are ridged, floral and squared with lotus leaves. A utility product widely used during the Victorian period.